So back in April I started a series of posts called TheTrial that report on the trial of various seeds and plants I taking part in for Thompson and Morgan. I am way behind in keeping them updated in how the plants are doing, but I do try and keep sending them in information as I go along. Overwhelmingly this trial has been huge fun. I have enjoyed it tremendously, from the word go I got excited at growing plants that I had not considered growing before. The trial has forced me to give up my snobbish attitudes towards certain plants and to embrace unknown varieties. Ok, that paragraph is partially a lie – I have not changed my attitude towards cucumber or lettuce at all and spectacularly failed to produce either to maturity from the seeds provided. This was not the fault of the seeds but my total inability to care a tinkers cuss about them (sorry). Anyway, suddenly, without warning, the trial became………… a trial! I received an email that made me happy, excited and terrified all at the same time. It contained the words – ‘Michael would like to visit……’ Oh feck! Michael Perry the New Product Manager of Thompson and Morgan and Kelly Aston, photographer, wanted to come and see how the plants were doing. This is where I am totally uncovered as a fraud. Yes dear reader, in reality I have a window box and a good imagination. Ok, that paragraph also contains at least one lie, my imagination is not that good. So a date was set and directions were sent so that hopefully Michael would find his way to my house without too much stress. It is not that difficult to find if you know where it is. It is not that difficult to find if you actually follow the directions the sat nav gives rather than try and interpret them. This makes it sound like I like in the countryside, I really don't. 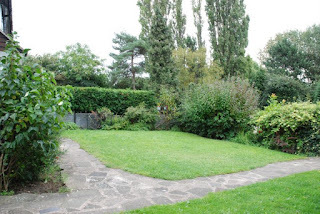 Much, much weeding, clipping, cutting and mowing preceded the day. Thankfully I had already booked the week off work and it was a long bank holiday weekend so I hoped I had time (rain permitting) to get things into shape. I realised very quickly that I was looking at my garden totally differently knowing that someone who knew about gardening and plants (knew, knew! makes a flipping living out of it!) was coming to visit. As I looked around I thought about things that I don’t hugely care about, such as the five foot tall nettles that pop up around the place, the very untidy greenhouse and vegetable bed area, the bit of path you cannot walk along because the roses droop over it – which I don’t mind I bend over and negotiate my way through, but for a visitor it might be a bit odd; all that sort of thing that to me doesn’t matter a jot and makes my garden mine and my territory suddenly looked like evidence of slovenly ways. I bought new hedgecutters, I needed them, my old ones had died, but suddenly it was urgent. I am not a good cutter of hedges. Thankfully I have few hedges, but there is a leylandii that is next door’s and I hack at it hopelessly every now and again. It is kept at a reasonable height and it is not an issue, I just cannot reach the top without a ladder so it is a wiggly from my side. My other hedges also suffer from height related wiggles. I am not good on ladders so either the wiggles are due to not using the ladder or using the ladder and wobbling a lot on it. Avoiding the ever present, vicious blackberries also is quite an issue, I tend to go into work on a Monday morning looking like I have gone through three rounds with a razor fence. I bought a strimmer, I have never owned a strimmer before. I did own a petrol-driven brushcutter at one point. I used it once, it worked brilliantly and cut much brush. It also cut down a couple of saplings that I wanted before I could stop it and I decided that my ankles were very much in danger of being removed too. I gave it away, too dangerous for me. 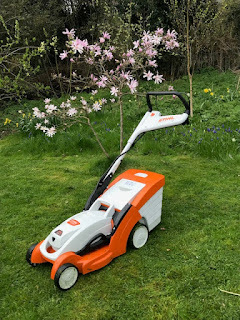 A strimmer I thought I would be ok with and I had a lot of fun strimming and singing Bob Marley songs as I did so (Jamming – with the words changed – I’m predictable but it made me happy). The great day arrived and so did the rain, much rain, lots and lots of rain. I am sure the local DIY store had sold out of Ark plans by 10am. Add to this the comedy value of a delivery that was expected and was already running late, plus Michael and Kelly arriving early (they had warned me they would, I just knew that everything would conflate together at the same time). Yes the gods were laughing at me heartily. They almost managed to find me without hiccough, they missed the road and parked in a nearby car park area, which was fine. Not finding my house is not that unusual but using initiative is. Usually people drive around for hours instead of just phoning me and asking for help. So hurdle number one was dealt with, they found me. As they arrived the rain paused, I could not say the sun came out, but the rain paused. The visit involved much talking, quite a bit of laughing and a lot of photographing, including some photographs of me, I am not a fan of photographs of me, I take the photographs usually so that I am not in them. Oh well, the full horror will be revealed in the Thompson and Morgan Spring catalogue. You have been warned. I think the visit went well, they didn't look too shocked at what they found and I enjoyed talking about my garden, what I enjoyed planting (and what I'm not so keen on). All in all it went well, it was an enjoyable morning. As Michael and Kelly left to go to their next appointment the rain started again, I said a brief thank you to the rain goddess for the pause. Glad to hear the visit went well and rain stopped while they were there! You are a star Mrs Brown and I didn't half enjoy your frickin post.